DIY - Piece of the Puzzle Fundraiser! What it is: Donors “purchase” a puzzle piece for a set amount ($1, $5, etc.) and write their name and/or message on the back. Once all the pieces are sold, the puzzle is assembled and framed between 2 pieces of glass so that both the puzzle picture and the names of all the donors can be viewed. The piece becomes a lovely keepsake. This is an especially popular fundraising idea for those seeking to raise money for adoption. What you need: Well, you need a puzzle. Depending on how much money you hope to raise, pick a puzzle with a realistic number of pieces and set the per-piece price appropriately. Puzzles with larger pieces are easier to fit names and messages on, but usually have fewer pieces in total… but perhaps a series of matching/coordinating puzzles could be chosen. Be careful that the puzzle you choose has a reverse side that is easy to write on. You will need a VERY FINE TIP Sharpie-type marker or pen to write the messages on the back, you can choose to use all one color, like black or have a variety of colored inks for your donors to choose from, again just be sure the marker or pen you choose will write well on the backs of the puzzle pieces for the puzzle you’ve chosen. Remember… you need every piece to complete the puzzle, so you can’t “mess one up” and just choose a different piece. You will also need to buy Puzzle Glue, which you can find at Wal-Mart and hobby stores. You will need to find someone to frame the completed puzzle so that both sides can be viewed… this will likely be your biggest expense in the project, consider asking around to see if anyone can (or knows someone that can) donate this service to your cause. 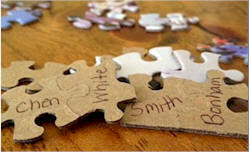 How to Proceed: Obviously you want to choose a puzzle that matches your theme or cause, perhaps one that will hang in the nursery if the fundraiser is for adoption, for instance. Or you can have a puzzle made from any photograph or picture you like… check the web, there are many companies that do this. Once you’ve purchased your puzzle and determined your per-piece price for donations, you’ll need to get the word out. In the modern world we live in today, that typically means using the internet and social media. Set up a website, or a Facebook page or a blog… email and message and call everyone you know and tell them what you’re doing and what the cause is. Ask them to spread the word and share your site with everyone they know. Tell them that pieces can be purchased by seeing you personally or by donating on your page (make sure they tell you what they want written on their piece.). Set up a PayPal account if you don’t already have one. Also, consider setting up a booth at a busy shopping area or at a local carnival or crafts fair (be sure to get appropriate permissions) to “sell” your puzzle pieces. Have lots of signs and photos to make it clear the cause you are fundraising for. Post updates to your website to show the puzzles progress if you can. Return on Investment: You should be able to pretty much set your goal and adjust your per-piece price to fit, but be realistic… both in the number of pieces you think you can sell and also the price your donors will be willing to pay per piece. This doesn’t have to be your whole fundraising campaign, use this as one of many fundraising ideas you employ to reach your ultimate fundraising goal. This is a good way to raise a few hundred to a few thousand dollars… not tens of thousands. Remember to factor in the costs of materials and framing. Why it Works: People like to feel like a part of something. Obviously your friends and family will appreciate that their donation will be recognized and actually hanging in your home or nursery or office or wherever, and that it will be a lasting reminder of their generosity. Strangers and friends of friends, acquaintances, etc. will still like the idea also, even if they never see the final puzzle completed. You should post pictures of the final result when all is said and done, though. Variation: Charge more for edge pieces and even more for the four corner pieces, perhaps sell these pieces to those special people you know are going to help you the most, like your parents or siblings, etc., especially if this is an adoption fundraiser, family will be a huge percentage of your donors more than likely.